Lock in a great price for Holiday Inn Express & Suites Denver South - Castle Rock – rated 9.2 by recent guests! location is perfect to visit family in Castle Rock. plenty of parking. new keys easier to use. excellent hot breakfast. comfy room. we liked it all. Although, I'm not a coffee or cookie person, I appreciated they were available in the lobby. Very friendly and helpful person (Suzette) at the check in. Located close to one of our favorite places to eat. Breakfast food and hours. Until 9:30 is great. The front desk people are terrific. We enjoyed the pool. Love the large windows giving lots of natural light. Very convenient to my daughter. In-room desk/chair not very comfortable to work w/ laptop for very long, but the dining area downstairs made a great substitute, and I appreciated having beverages handy there while I worked. I enjoyed the friendly staff, the beautiful view of the Rocky Mountains, the on-site laundry facilities and the continental breakfast. Staff went above and beyond what I expected. Friendly and competent. Beautiful colors & modern interior. Lots of textures. Fast, efficient check in with very courteous staff. Very clean hotel. Nice pool & hot tub. Spacious room. Excellent breakfast with lots of choices. Great coffee! Afternoon fresh baked cookies was delightful touch. Room key that you swipe instead of putting into tiny slot is great improvement! Holiday Inn Express & Suites Denver South - Castle Rock This rating is a reflection of how the property compares to the industry standard when it comes to price, facilities and services available. It's based on a self-evaluation by the property. Use this rating to help choose your stay! Offering an indoor pool and a fitness center, Holiday Inn Express & Suites Castle Rock is 40 minutes’ drive from Denver International Airport. Free WiFi access is available. 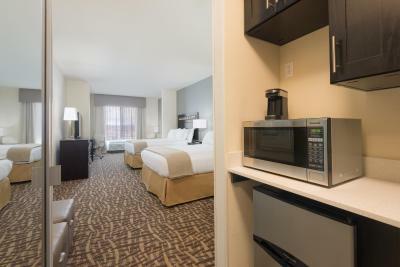 A TV is featured in each room at Holiday Inn Express & Suites Castle Rock. At Castle Rock Holiday Inn Express & Suites a hot tub is available. The property offers free parking. United States Air Force Academy is 30 minutes’ drive from the property. Outlets at Castle Rock is 1,950 feet from Holiday Inn Express & Suites Castle Rock. 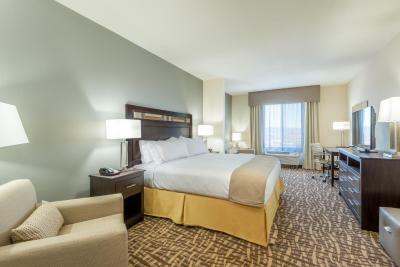 When would you like to stay at Holiday Inn Express & Suites Denver South - Castle Rock? This suite has a microwave, cable TV and sofa. This twin room has air conditioning, tile/marble floor and iPad. House Rules Holiday Inn Express & Suites Denver South - Castle Rock takes special requests – add in the next step! Holiday Inn Express &amp; Suites Denver South - Castle Rock accepts these cards and reserves the right to temporarily hold an amount prior to arrival. Holiday Inn Express & Suites Denver South - Castle Rock accepts these cards and reserves the right to temporarily hold an amount prior to arrival. Please inform Holiday Inn Express & Suites Denver South - Castle Rock of your expected arrival time in advance. You can use the Special Requests box when booking, or contact the property directly using the contact details in your confirmation. Your staff, the older lady at the time of our check-in and throughout our stay, she was on duty; what a delight. The other Kitchen staff were all so helpful. I liked the immaculate cleanliness and no clutter environment. It emits peace and relaxation. Thank you. The front desk staff was fantastic, but the lady working in the breakfast area, was a little rude and was very intrusive and made my child feel very uncomfortable about what she got to eat, which was clearly non of her business. She hovered way to much around our family trying to eat and made us very uncomfortable. there was nothing we didnt like! No supervision in the pool area. Too many kids running and Jumping. Not an equitable opportunity to enjoy the pool, if you don't have kids. The wifi was a little funky. Better than normal breakfast. Clean. Very new. Courteous. Easy to find, nicely appointed, good breakfast with eggs and sausage and bacon, quiet. No mini fridge. The shower head was very weak. It's hard to rinse soapy hair. Bath sink counter area is too small.